All cats are gray in the dark – people are pretty much the same regardless of appearances. Cat got your tongue? – Why aren’t you talking? May date to middle ages when body parts severed for punishment were fed to the cats or pigs. When the cat’s away the mice will play – good off when not supervised. More than one way to skin a cat – this saying actually relates to cleaning catfish, which has skin too tough to eat. Curiosity killed the cat – being too nosy can land you in trouble. This saying was penned by Ben Jonson in Every Man in His Humor. “I believe cats to be spirits come to earth. A cat, I am sure, could walk on a cloud without coming through.” Jules Verne. “I have lived with several Zen masters — all of them cats.” Eckhart Tolle. Cats, big and small, are amazing animals. They come in so many different colors, can jump like Olympians, can move silently……Following is a list of some of the other fantastic things about cats. Cats have true fur, with both an undercoat and an outer coat. Cats have a full inner-eyelid, or nictitating membrane, which serves to help protect the eyes from dryness and damage. When the cat is ill, the inner-eyelid will frequently close partially, making it visible to the observer. A cat cannot see directly under its nose, which is why it cannot seem to find tidbits on the floor. They can see blue, green and red. In relation to their body size, cats have the largest eyes of any mammal. They see six times better in the dark and at night than humans. Cats can’t taste sweets. The average cat food meal is the equivalent to about five mice. Yum. Cats do not think that they are little people. They think that we are big cats, which influences their behavior in many ways. A cat has more bones than a human, 230 to our 206. Cats have an average of 24 whiskers, arranged in four horizontal rows on each side. They are the only animals with retractable claws. The more cats are spoken to, the more they will speak back. You will learn a lot from your cat’s wide vocabulary of about 60 different sounds. You can tell a cat’s mood by looking into its eyes. A frightened or excited cat will have large, round pupils, an angry one, narrow pupils. The pupil size is related as much to the cat’s emotions as to the degree of light. Cats walk on their toes, stepping with both left legs, then both right legs when they walk or run. They are capable of sprinting at about thirty-one miles per hour. A cat can jump even seven times as high as it is tall. Because they lack a true collarbone, cats can generally squeeze their bodies through any space they can get their heads through. You may have seen a cat testing the size of an opening by careful measurement with the head. Abraham Lincoln loved cats, and had four of them while he lived in the White House. 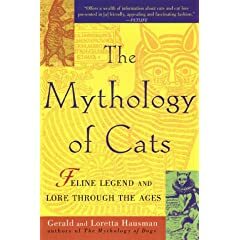 Not a scholarly compendium, The Mythology of Cats is more an engaging collection of folkloric stories, drawn from history, literature, and religion. Organized into 25 sections by various breeds, and filled with pithy quotes, this book covers such ideas as feline aloofness and self-containment, the portrayal of this mysterious animal in works by such notables as Steinbeck, Twain, and Yeats, and the role of the cat in various times and cultures. The evolution of breeds old and new, wild and tame, is briefly but informatively discussed, as are such traits as clairvoyance, intelligence, and loyalty. This is a book for readers who have or have had satisfying relationships with these wonderful creatures, informative and entertaining at the same time. Enjoy!